Blastogenesis is the initial phase of differentiation that results in formation of the prochordal plate (1, 2, 3). During POD 1–4 the human embryo undergoes approximately five rounds of cell division to produce 32-cell morula. Inner cell mass: The inner cell mass gives rise to the embryo proper. Trophoblastic cells: The surrounding trophoblast cells give rise to placental tissues. Epiblast: The dorsal layer of the inner cell mass. Hypoblast: The ventral cell layer of the inner cell mass. 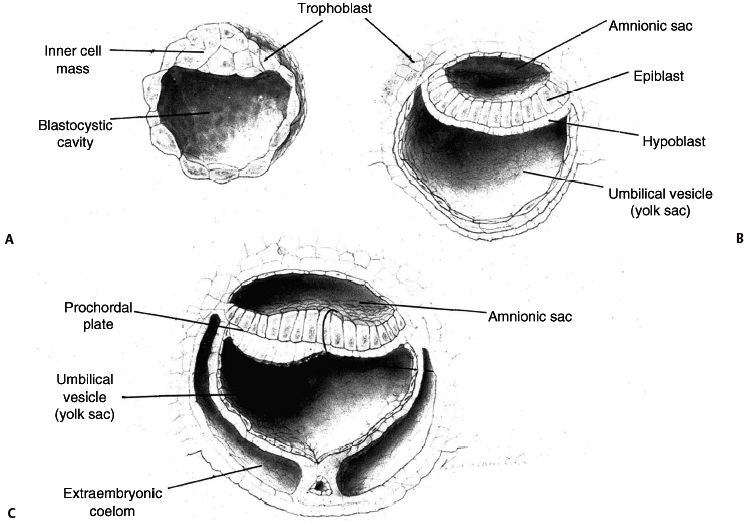 Amnionic sac: This cavity develops dorsal to the inner cell mass by POD 12. Yolk sac: This cavity develops ventral to the inner cell mass by POD 12. Formation of cranial end: The cranial end of the embryo is visible by POD 13 as the prochordal plate, a thickening of the cranial end of the embryo, becomes visible. Early formation of the embryo: A. Formation of inner cell mass and surrounding trophoblast. B. Formation of epiblast, hypoblast, and amnionic sac. C. Formation of prochordal plate (craniocaudal orientation). From Dias and McLone (2).